The Italian American Police Society of New Jersey is proud to announce that Fairfield Police Chief Anthony Manna will recieve its Law Enforcement Executive of the Year Award. 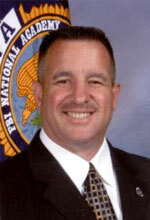 Chief Anthony G. Manna was born and raised in Fairfield. He is a graduate of West Essex High School and attended Caldwell College, where he graduated with a BA Degree in Criminal Justice. Prior to joining the police department, he was a member of the Fairfield Fire Department for 10 years. He joined the Fairfield Police Department on January 4, 1985. From 1985 until 1988, he served as a patrol officer. From 1989-1991, Deputy Chief Manna served on the West Essex Sheriff's Tactical Narcotics Enforcement Team known as W.E.S.T.N.E.T., a narcotics task force made up of officers from Fairfield, West Caldwell, North Caldwell, Caldwell, Verona, Cedar Grove and the Essex County Sheriff's Department. The task force, which conducted undercover operations throughout Essex County, was responsible for over 250 arrests duing their operation. He was promoted to sergeant in January 1995 and eventually became the Investigative Division commander, responsible for overseeing all criminal investigations for the department. In June 2003, he was promoted to the rank of lieutenant at which time he was transfered to the Uniformed Division where he served as a section lieutenant, responsible for overseeing two patrol squads. He also served as the officer in charge of the department's training, firearms, and honor guard units. In October 2009, he was promoted to the rank of deputy chief and took over as the officer in charge of operations. While on this assignment, he served on the Essex/Union Auto Theft Task Force. In July 2010, Deputy Chief Manna was selected to attend the 242nd Session of the prestigious F.B.I. National Academy in Quantico, Virginia. Upon his return, he became the department's public information officer. In May 2014, , Deputy Chief Manna was named the officer-in-charge of the department by the Fairfield Governing Body. He was appointed as chief of police on January 4, 2016. Chief Manna will be recognized at the Society's Annual Gala on March 30th at The Fiesta.